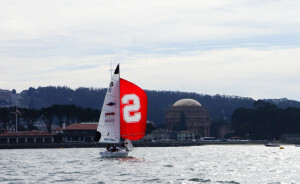 Stanford sailing has seen its youth shine in many events across its first three weeks of competition. Underclassmen impressed for the Cardinal in the PCCSC conference singlehanded championships, dominating both the men’s and women’s events and securing three spots at singlehanded nationals, held Nov. 6–8 in Norfolk, Virginia. Sophomore Luke Muller led the charge in the men’s division, riding six wins in 16 races to best a decent late challenge from Cal’s Richard Didham and capture the conference title for his second straight year. Like in 2014, Muller led the regatta from the first race to the last, a testament to the consistency and talent that should land him in contention for the national men’s singlehanded title for years to come. In the women’s event, sophomore Haley Fox and freshman Olivia Gugliemini grabbed the top two positions to reach nationals for the first time each. Fox and Gugliemini cemented their victory with one-two finishes in each of their final four races, opening up a large lead over their competition in the seven-boat event. More strong performances against other PCCSC teams came in the doublehanded Trojan Women’s Invite. Freshman skipper Cassie Obel and her crew sophomore Haley Fox were narrowly edged into second in the event after UCSB’s Ginger Luckey took first in the final five races, while sophomore skipper Elena VandenBerg and her crew, Gugliemini, finished just 7 points below in fourth. The Cardinal’s women’s team had a bit of a harder time in the Navy Fall Women’s Interconference, finishing in seventh place. Nevertheless VandenBerg (this time sailing as a crew) and freshman skipper Maria El-Khazindar did acquit themselves nicely with a tiebreaker victory in the regatta’s Division B.
Stanford’s excess of young but talented female skippers should put them in contention for the women’s title in each of the next four years, and early indications suggest that they have the potential to take home the Cardinal’s first doublehanded national championship in program history. Stanford hasn’t achieved quite the same level of success in coed divisions yet, but many of its results have been strong, considering the infrequent use of senior skippers Antoine Screve and Axel Sly and the comparatively late start to Stanford’s season. Skippers sophomore Will La Dow and freshman Russell Clarida, along with crews senior Yuki Yoshiyasu and freshman Kathryn Booker, managed a seventh-place performance at the Hood Trophy regatta on Sept. 26–27, besting young squads from top-ranked programs like Yale and Fordham. Stanford will look to continue to tune its performance across the country until its fall season wraps up in early November.